Take a look at your underwear drawer. Now really evaluate it. If you haven’t given your underclothes a second thought until now, a new stock may be in order. 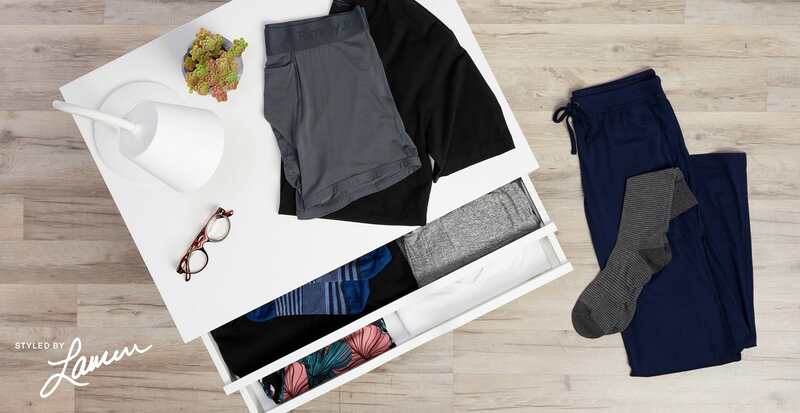 We asked Lauren, one of our own stylists, to talk a little bit more about the hardest working pieces in your drawers. Without any judgement, let’s begin. If you’re just not loving the underwear you’re currently working with, see if a material switch will fix the problem. Cotton is a great breathable, natural fiber. But performance fabrics such as acrylic, microfiber, and nylon all have moisture-wicking properties and are known for their durability. Functionality is important when it comes to fabric, but let’s be real, so is comfort. When we think of loungewear, we think of the pieces that make you want to binge-watch TV. “Fresh sleepwear is a game changer, with ultra soft stretchy material, you feel like you’re wearing nothing at all,” Lauren says. Note: Even though it resembles athleisure, loungewear isn’t designed to be worn outside the house. See athleisure looks we love if that’s more your speed. Do some of your T-shirts have underarm stains? Yes? It’s time to restock. And for your next round of white tees, consider upgrading to the more premium Pima cotton—it’s softer and more durable. While stains will happen (usually because of a reaction between your sweat and chemicals like aluminium in deodorant) it helps to let your deodorant dry completely before putting on your shirt. And in contrast to your plain tees, show some personality with socks in bright, colorful prints. “Meeting at work? Going to happy hour? Wear fun socks as a conversation starter!” Lauren suggests. Some of our favorite brands are Happy Socks and Ted Baker.